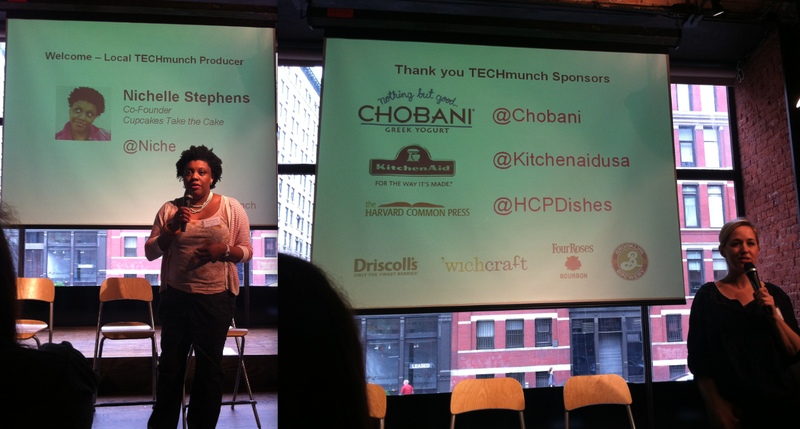 Back in May, I was invited to speak at an event called TechMunch. TECHmunch took place Saturday June 11th, 2011 in New York City. What is TechMunch you ask? And why was Tameeka Time - the non-food-blogger invited? TECHmunch is a food bloggers conference. It's a one-day conference mixed with panels, food tastings, tech-talk, blog/vlog tips, and an opportunity to network with others who share your same passion of food/blogging. TECHmunch NYC was and is produced by Babette Pepaj (@BakeSpace), she is the founder of BakeSpace.com and the event is co-produced by Nichelle Stephens (@niche), the co-founding editor of the site Cupcakes Take the Cake. Now with that said, myself and several other tech based individuals were invited to help answer any technical questions the bloggers/vloggers would have for creating internet content and distributing it in a professional manner. 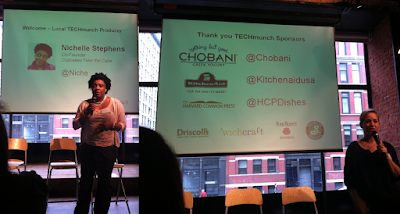 For those of you who were not able to attend, I'm going to back-track and give you blog readers a quick breakdown of how this years NYC TECHmunch went down. All photos have been taken with my iphone. After Nichelle and Babette introduced the event, everyone in the audience was given the opportunity to chose from one of these lovely KitchenAid products via a raffle. Unfortunately, my business card was not lucky enough to win a mixer but hey maybe next time I'll win. This was more of a conversation rather than a panel with moderator Jessica Lee Binder, publisher of Foodmayhem.com and Cathy Brooks the host of Other than That and Social Media Hour. *I really enjoyed Cathy's advice since I have two internet personas; Tameeka Time (vlogger/blogger) and Tameeka Ballance (videographer). Be sure to follow Cathy on twitter, she's got a lot of wisdom on this topic. Next up, Nicole Taylor (@foodculturist) - host of Hot Grease on the Heritage Radio Network had to break the news to everyone that Chef Jacques Torres was unable to make the event. But we were lucky enough to view a pre-recorded interview of Nicole and Chef Jacques. After the video my panel was up! I was joined by Moderator Tricia Okin of papercutny.com, Tanya Edwards from the FoodNetwork.com, Eric Issac photographer of SnapFood.com, Eric Rochow the host of Gardenfork.tv, and finally myself Tameeka Ballance host of Tameeka Time. With full bellies, we headed back into the main room and were given an amazing presentation by Chris Pearson. His panel was titled Designing Presentation by Chris Pearson. You can find Chris at DIYThemes.com. *One major tip I learned from this group was to be consistent and exact with your post titles. You want people to find you by what you are putting out there. If your writing about a certain topic, label your post with the actual topic name. And this applies for blog posts, tweets, youtube/vimeo/blogtv videos, or Facebook posts. The next panel after the snack break was How to Attract Awesome Brands and Build Partnerships featuring Moderator Erik Deutsch of PR Mashup, Jessica Randazza of KitchenAid, Emily Schildt from Chobani, and Babette Pepaj the founder of Bakespace.com and TECHmunch. The final panel went up and it was a good one. The panel was titled How to Market your Blog and Turn it into a Brand/Business. This panel was moderated by the wonderful Nichelle Stephens of Cupcakes Take the Cake, David Leite the author of The New Portuguese Table, Cathy Erway author of The Art of Eating In, Adam Salomone an associate publisher at the Harvard Common Press, and Jackie Gordon the singing Chef and owner of Divalicious Chocolate. Once the above panel finished it was time to party and network. The event's closing party was sponsored by The Harvard Common Press and drinks were provided by The Four Roses Bourbon. I had a great time and I hope to return next year and I hope to start my own food blog in the near future. For more info go to Techmunch.bakespace.com - if you live in Boston be sure to check out the site for when Techmunch is in your town.